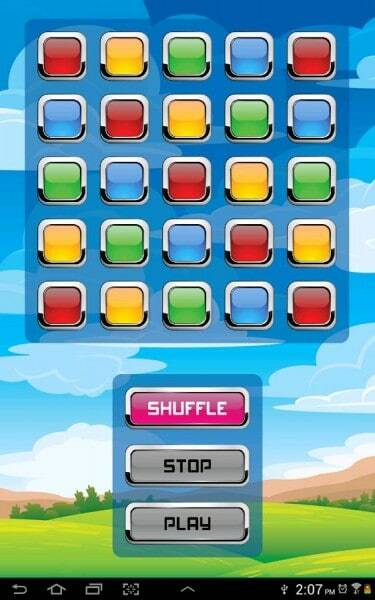 Description: Memory Rainbow is a game for Android that aims to test out your memory and logic skills. 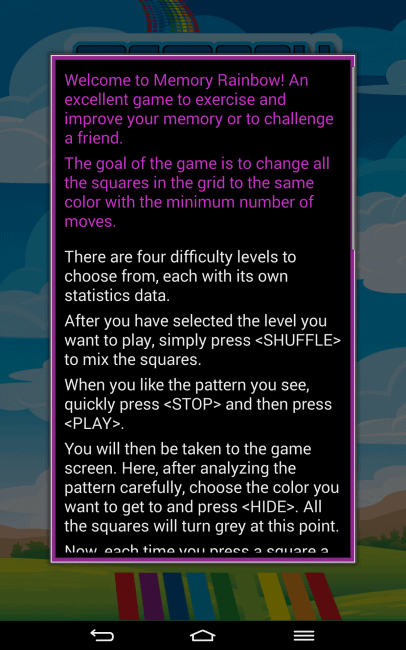 The aim of the game is to turn all of the squares in a grid to the same color. 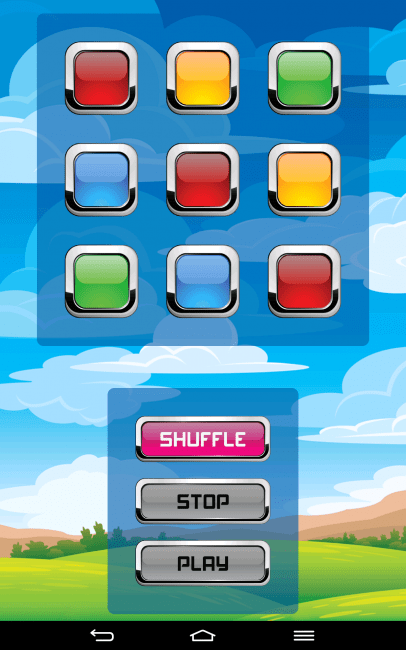 The game focuses around being able to remember which square is which color, and how many taps it takes to turn it the same color as other squares, while all the squares have gone blank. It’s this that makes up the foundation of the gameplay while playing Memory Rainbow and while it seems simple at first, it can be quite difficult. Designed as a way to test your friends, or just give your own brain a workout, Memory Rainbow is a game that players of all ages will enjoy. 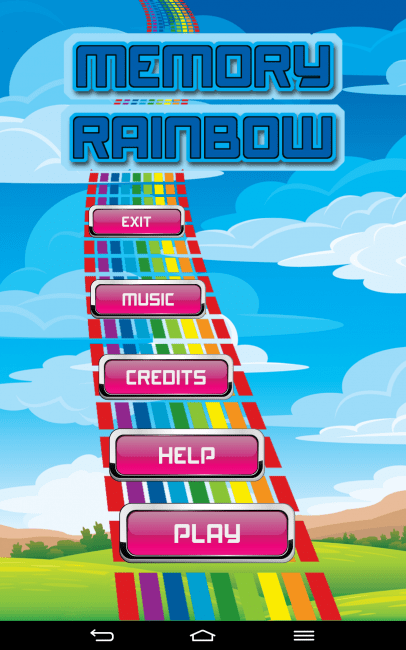 How it Works: Before you can get started, you’ll need to download Memory Rainbow from the Play Store. Then you can start playing. It’s well worth taking a look at the game notes and how to play before diving in, especially if you’re new to the game. There are a number of different difficulties to choose from. Each one of them has a different grid size to it, which makes it harder to remember which colors are already the same. 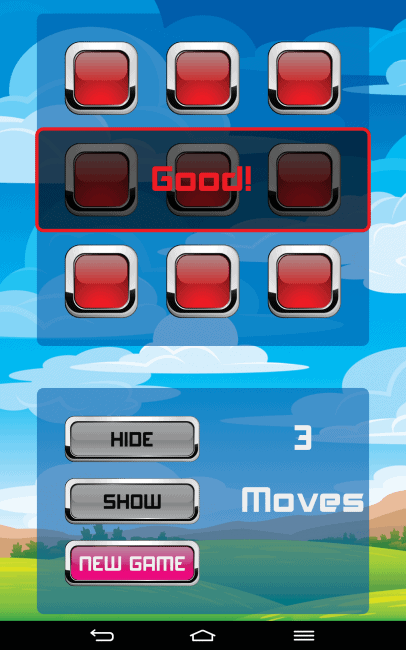 The easy mode (which is a great starting point) features a 3×3 grid. When you start the game, you’ll see the colors and their position in the grid. You have to shuffle these colors, and then stop them before you can play the game. When playing, you need to hide the colors, and then tap on that square a certain number of times to try and get the colors to change to the same as all the other tiles. Each time you hide and then show the tiles and their colors is one move, the aim of the game is to turn every color the same in as few a moves as possible. When you do get all the tiles the same color, you’ve complete the level. You can view your stats from the front page, and see what your average move score is. Opinion: Memory Rainbow is a nice and simple puzzle game that adequately tests your logic skills and is definitely a nice exercise for my brain. It is a real shame that there isn’t more to the game, but I guess that’s also part of its charm. It’s easily approached and can be a good way to test your friends or your family, too. I can see this being a good way of giving kids’ brains a nice and simple work out as it really does get the brain going, I just wish a more difficult version was available without having to pay for it, having said that there are no ads or banners getting in your way. Speed (4/5) – A quick game, Memory Rainbow will run great on pretty much anything. Features (4/5) – As simple as it is, Memory Rainbow is a lot of fun and there’s no complicated rules or anything like that to get in your way. Theme (4/5) – Colorful and simple, Memory Rainbow is easy to use and it looks good on tablets as well as phones. Overall (4/5) – Memory Rainbow might not be the most exciting game, but it’s a solid and fun puzzler that will tingle your brain and get you going. Easy to use, without being too easy for those not used to puzzle games. Looks good on tablets as well as smartphones, and with no ads cluttering your view it’s a relaxing and challenging experience. 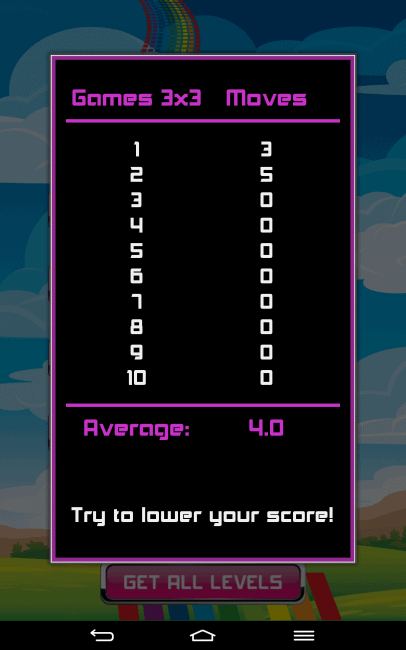 Very hard levels are on offer for those that want to really test their brainpower. Colorful and inviting, even kids will find something to love about Memory Rainbow. You have to pay to unlock the other levels. Can get quite samey when playing on your own. Conclusion: At the end of the day, Memory Rainbow might not be all that exciting, but it’s still a lot of fun. 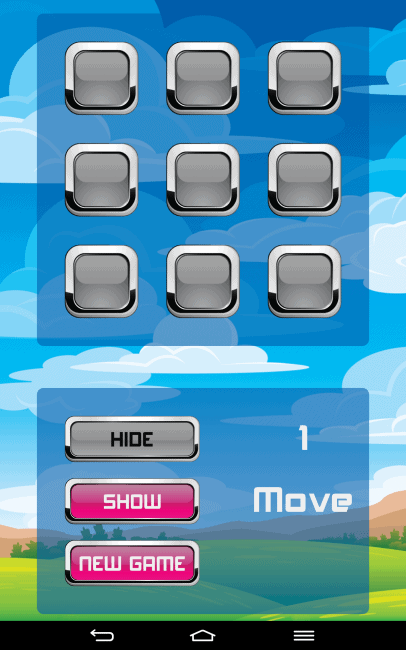 It aims to provide a brain teasing puzzle game, and it does just that. It’s simplicity means that kids and parents can play along together and there’s no need to jump through any hoops when trying to perfect your score. A simple, entertaining game to get those brains going, Memory Rainbow works well. The post Sponsored Game Review: Memory Rainbow appeared first on AndroidHeadlines.com |.